President Donald Trump speaks about his plan to combat opioid drug addiction at Manchester Community College, Monday, March 19, 2018, in Manchester, New Hampshire. Those in Maine’s medical and criminal defense communities were largely skeptical about President Donald Trump’s plan to combat the nation’s opioid addiction crisis, unveiled Monday afternoon in a high-profile address in neighboring New Hampshire. A Brewer addiction counselor dismissed the president’s proposed national publicity campaign to deter drug usage as weak, while some of the state’s top criminal defense attorneys described Trump’s pledge for cuts to prescriptions as “deeply troubling,” saying the step would only drive up demand for illegal drugs on the streets. The president spoke Monday afternoon at Manchester Community College in New Hampshire, telling the audience there and countless others watching broadcasts of the talk online or on television that the country must “get very tough” on drug traffickers as part of his three-pronged plan for driving down addiction cases and overdose deaths. 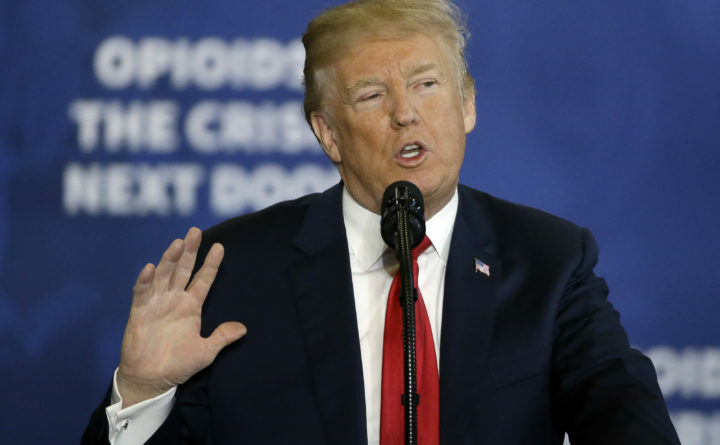 Trump renewed calls for the death penalty for drug dealers who commit a homicide while dealing drugs, though scholars have said such punishments would likely be challenged on a constitutional basis. The president additionally said the administration will launch a website and television ad campaign to teach young people about the dangers of opioid use. He also said his administration will push to reduce painkiller prescriptions by a third and increase access to treatment for those battling addictions, although details about those goals remained unclear Monday evening. The president on Monday pledged to inject “at least $6 billion in new funding” into combating the crisis in 2018 and 2019, but was not specific on how it would be spent. But those in the medical community and across the courtroom were less supportive of the president’s position. Jim LaPierre, an addiction counselor and executive director of Higher Ground Services in Brewer, said proposals such as imposing the death penalty for drug dealers or launching a national publicity campaign are “ludicrous” in the face of a crisis that claimed 418 Maine lives in 2017. Maine voters approved Medicaid expansion in 2017, but while it is slated to take effect this July, Gov. Paul LePage and many Republican lawmakers remain opposed and challenges to its implementation are anticipated. Similarly, the emergency overdose-reversing medication Narcan, approved in 2016 for over-the-counter availability in Maine pharmacies, remains entangled in bureaucratic red tape. Maine has only one medically supported detox facility, with 41 beds, which is located in Portland. LaPierre said he is hopeful Trump’s plan may translate into meaningful changes here, including, critically, the funding to make them a reality. But he is wary that too much of the available federal money will be allocated for law enforcement and insubstantial educational efforts, and not enough for expanding access to treatment and other life-saving measures. “One of the greatest transitions I’ve seen in my career is the number of law enforcement people who have said to me, ‘We cannot arrest our way out of this,’” LaPierre said. And while factual information about substance abuse and addiction belongs in every school’s health curriculum, simplistic abstinence campaigns, such as the ineffectual “Just Say No” campaign launched in the early 1980s as part of then-President Ronald Reagan’s war on drugs — are destined for failure, he said. Dr. Noah Nesin, vice president for medical affairs at Bangor-based Penobscot Community Health Care, said Trump’s reference to providing addiction treatment to inmates is encouraging. Nesin, who r ecently announced he will prescribe Narcan over the phone to any Mainer who needs it, said evidence-based curriculum materials are available at every grade level and should be broadly incorporated into Maine schools, and that long-term interventions to support at-risk children and families affected by trauma, poverty and instability must be widespread. Maine is already well ahead of the curve when it comes to changing prescribing practices for opioid drugs, according to Gordon Smith, executive vice president of the Maine Medical Association. That’s due in part to voluntary efforts in response to the opioid epidemic here over the past 15 years or more, he said, but also more directly linked to a 2016 Maine law that imposes a number of requirements on prescribing opioids. “There’s nothing like passing a law to make change happen,” Smith said. With some exceptions for cancer patients, those with severe chronic pain and those at the end of life, the law limits the daily dose an individual may be prescribed and the duration of the prescription. It also requires prescribers to check with the state’s prescribing database, established through the Office of Substance Abuse in 2004, before issuing a prescription for controlled drugs like opioids or benzodiazepines. It requires that all prescriptions for such drugs be written electronically and requires that prescribers participate in ongoing education about opioid painkillers and the potential for abuse and addiction. “No other state has done all these things in the period of time that we have,” Smith said. According to a national study of states’ opioid painkiller prescribing from 2013 through 2016, Maine dropped 21.5 percent, from 1,105,502 prescriptions written in 2013 to 867,776 prescriptions in 2016. It was the fourth largest decrease among all states during that period. Smith said a larger challenge now is the call to expand access to medication-assisted addiction therapy, using drugs such as buprenorphine, more widely known as Suboxone, and methadone. Both are highly regulated by federal guidelines. Methadone may only be dispensed at specifically licensed facilities, but Suboxone may be prescribed by any primary care provider or other prescriber who has completed an eight-hour training program and who can provide access to mental health counseling services. Expanding access to Suboxone therapy throughout the state is widely seen as an important step to bringing more addicted individuals into treatment. Smith said about 600 Maine providers are certified to prescribe Suboxone, but fewer than half actively treat patients who suffer from addiction. Reasons include low Medicaid reimbursement, regulatory barriers and lingering stigma against addiction, even among health care professionals. “Some people still see this as a character flaw instead of a chronic disease,” Smith said. Spencer made no mention of Trump’s goal of increasing access to Narcan and Suboxone but pointed to the role of the state’s prescription monitoring program in driving down the number of opiate prescriptions here. ”DHHS looks forward to continuing our partnership with the federal government to address this crisis,” Spencer wrote. Nadeau said the plan overlooks the fact that the vast majority of drug traffickers are addicted to drugs. Brewer attorney Matthew Erickson, who represents defendants charged with drug crimes in federal court, harshly criticized the president’s proposal. He predicted it would lead to greater violence and more gang activity. Erickson said Trump’s plan would increase rather than decrease overdose deaths. The defense attorney suggested that opiate addiction should be treated as an addiction with treatment and education. “Punishment may also offer the opportunity to provide a defendant with needed treatment,” he added.